Jagan Institute of Management Studies (JIMS), located in Rohini, envisions to provide quality education to its students with a focus on holistic development. The institute realizes the importance of providing rounded education to the students. It gives opportunities that go beyond classroom knowledge. The aim is to make them responsible citizens who are well groomed. Students also get to meet fellow colleagues from diverse backgrounds and cultures. Experiential training with earning tools – like group discussions, presentation, role-plays, management games leads to academic excellence. 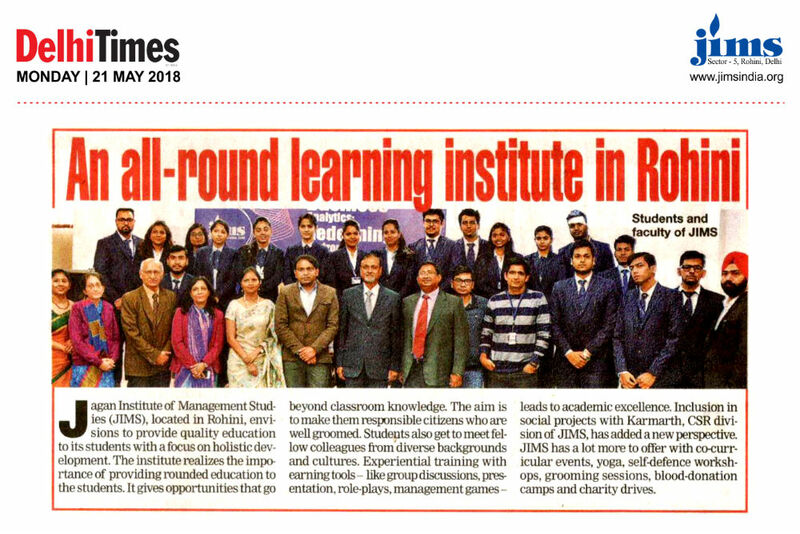 Inclusion in social projects with Karmarth, CSR division of JIMS, has added a new perspective. JIMS has a lot more to offer with co-curricular events, yoga, self-defence workshops, grooming sessions, blood-donation camps and charity drives.